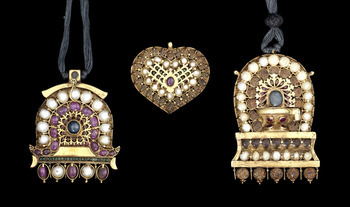 As acts of veneration, Hindu temples frequently adorn their idols with gold jewelry. For obvious reasons, it is extremely rare for these sorts of pieces to make it to the market, but Bonhams is currently selling a 28-piece private collection of 17th-19th Century pieces. 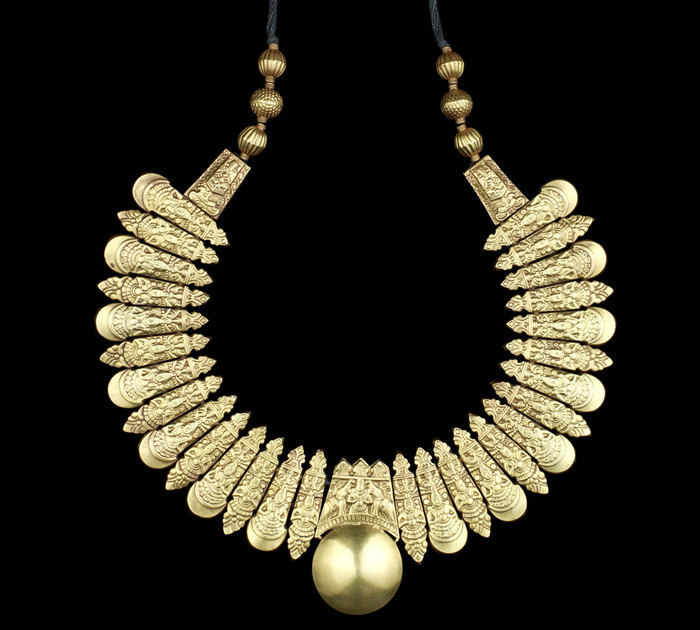 Gold Pendents Gold Kevacham. 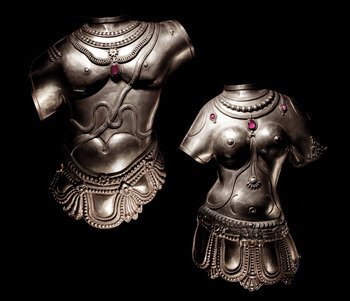 The word kevacham (kavacham) means armor, and refers to decorative armor worn by the god or goddess. 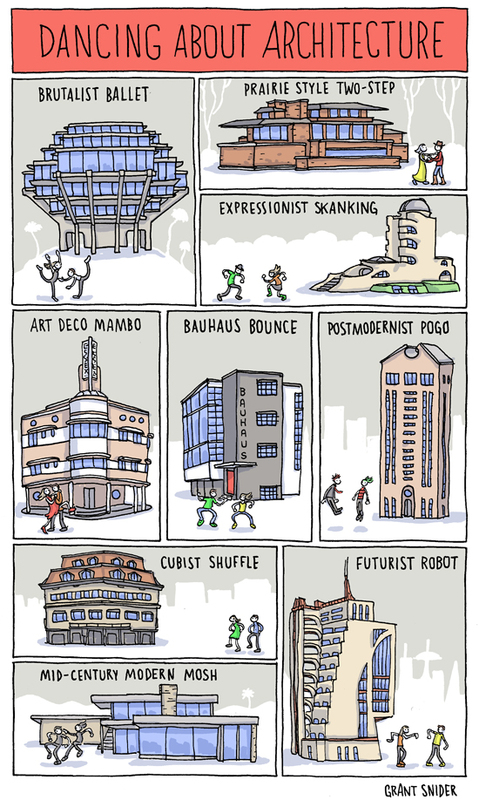 Where apparently X can be any noun. 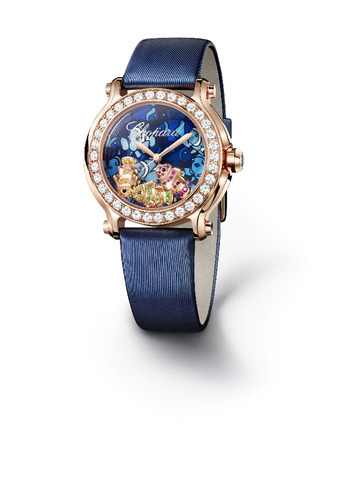 Chopard (mentioned before) has added Happy Fish and Happy Beach pieces to their "Happy" collection, the sprawling set of pieces, begun with the Happy Diamond, with little mobile gems over the dial. 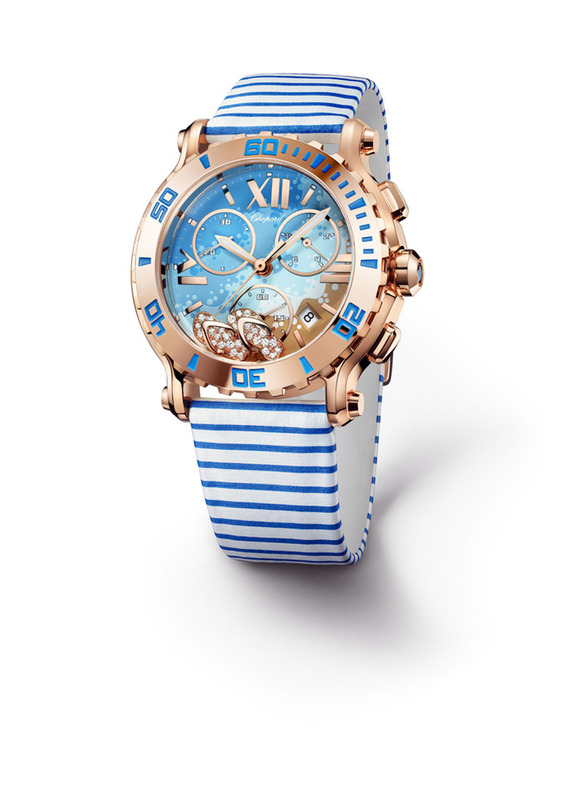 Finally the Happy Beach chronograph, with a 42mm rose-gold case and uni-directional rotating bezel. 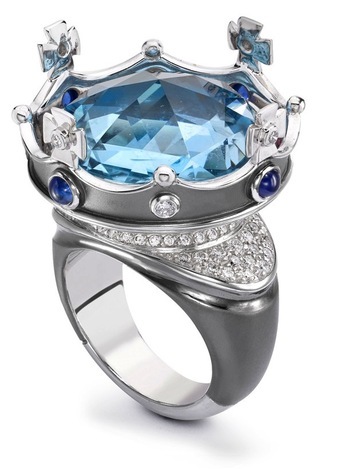 One more piece from the Annoushka Fantasie Jubilee collectio, the Prince Charming Ring. 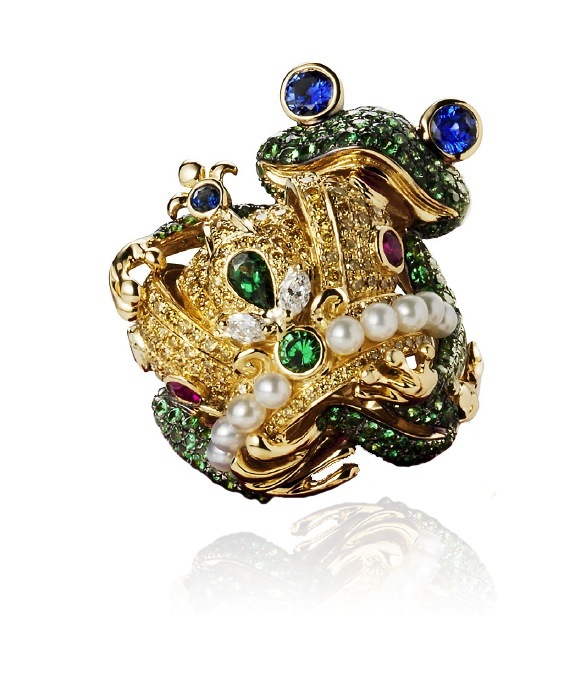 14,000£ gets you an 18kt gold frog set with diamonds, sapphires and garnets clutching a pearl-studded crown, all as a ring. 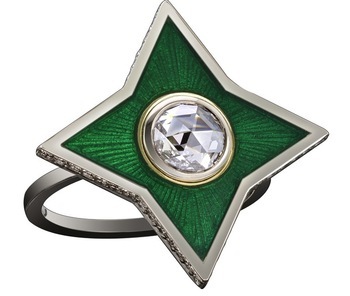 Since it's the diamond-jubilee year of Queen Elizabeth, some of the jewelry brands, particularly those with some, no matter how tangental, connection are putting out themed collections. 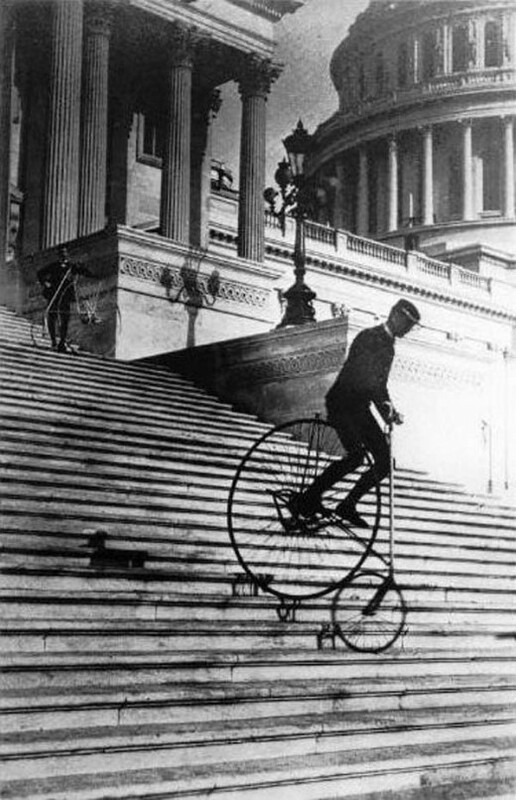 To be fair, we've seen much sillier reasons for a themed collections! 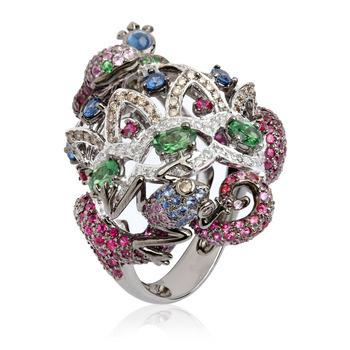 The first pieces were all designed by Wendy Yue for Annoushka, all are 18kt white gold and set with diamonds, rubies, garnets and sapphires. 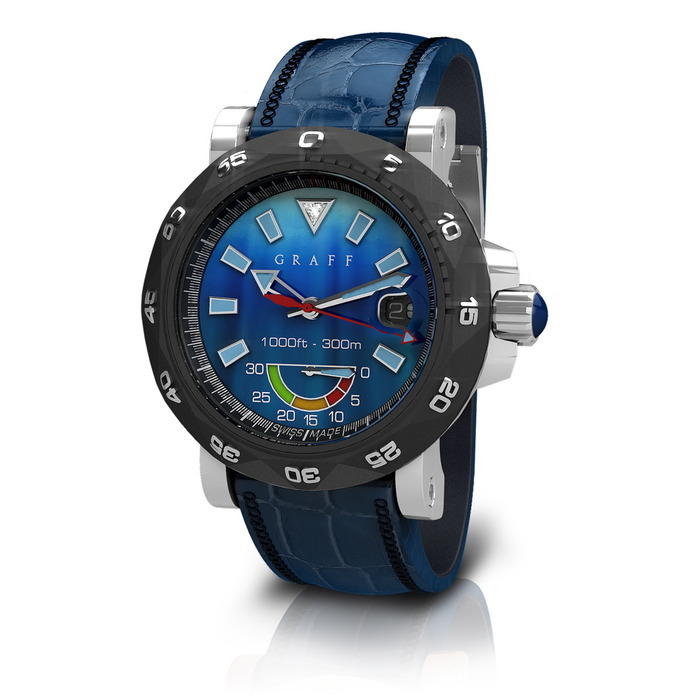 The collection ranges in price from 11,000£ to 16500£. 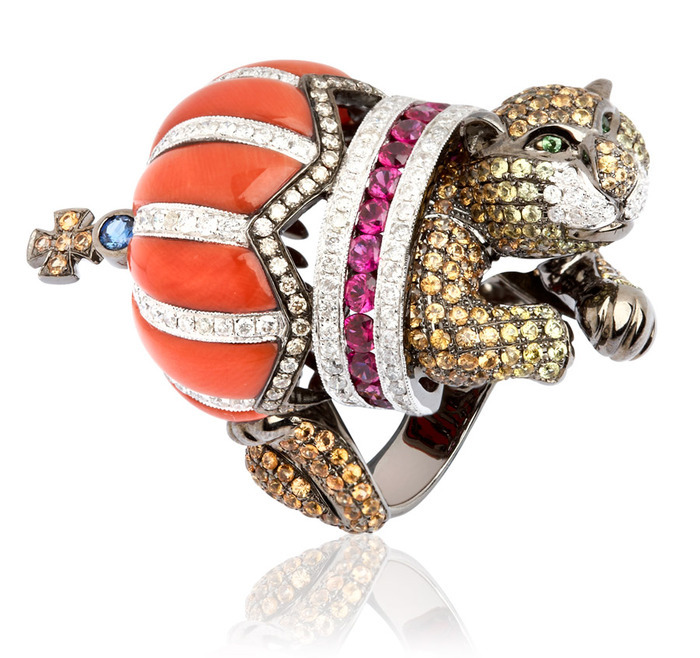 Lion Ring. 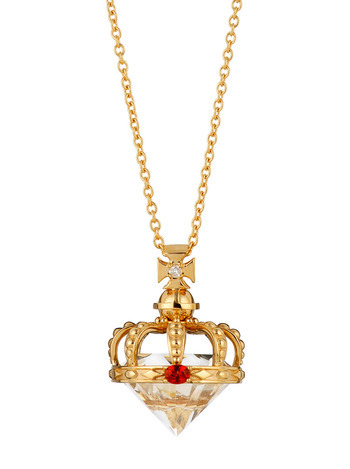 The coral-colored part of the crown is, in fact, cut and polished coral. 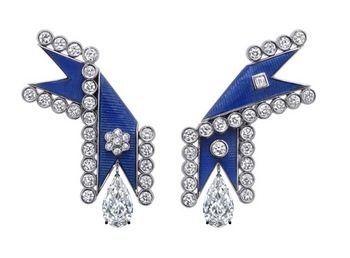 From Stephen Webster (previously mentioned) and Garrard comes a more obviously-connected collection. 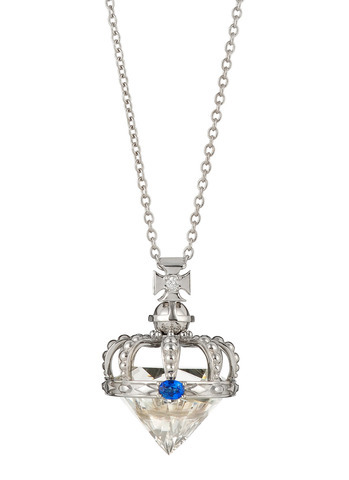 Garrard, apart from being the oldest jewelry house in the world, has a long-standing connection with the House of Windsor, including being the maker of most of the currently used crowns. 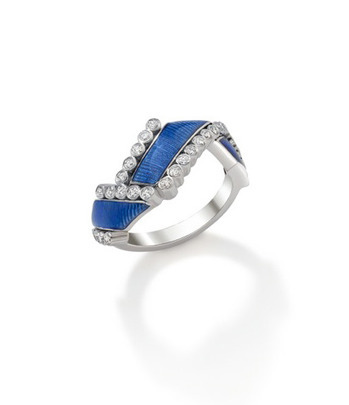 There are 12 items in the Diamond Jubilee collection, each including the eponymous birthstone. 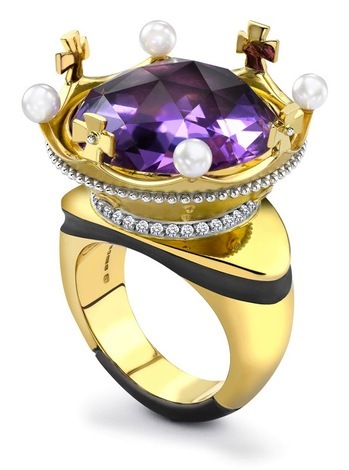 June has an additional pearl in the orb set atop the crown. 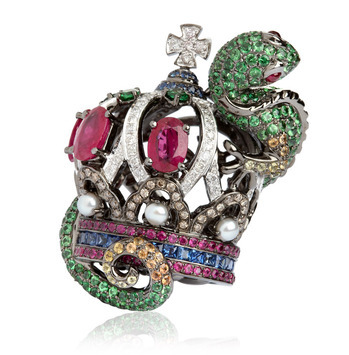 From Theo Fennell comes a collection of rather bland, if nice, pieces. 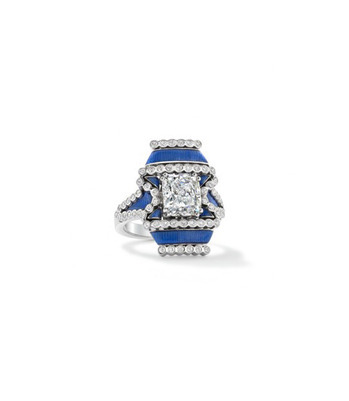 I think the rings, particularly the white-gold one, are nicer then either the earrings or the necklace. 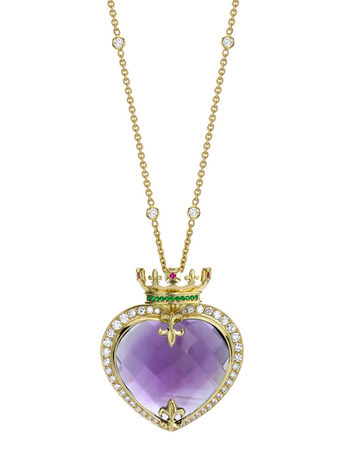 Necklace set with a large, heart-shaped briolette-cut amethyst. 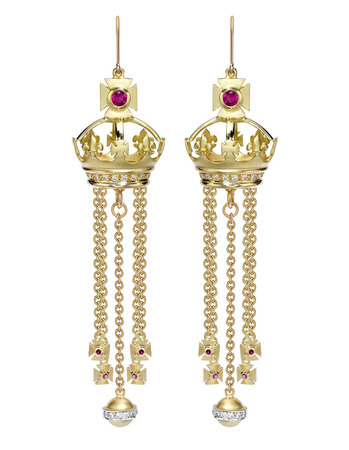 Finally a collection from Solange Azagury-Partridge(previously mentioned), the Regalia. It's an interesing melding of a couple of traditional elements, the ribbon from the "Order of the Garter" (the highest current order of chivalry) done in guilloche enamel and surrounded with rose-cut diamonds(an antique, low-facet-count cut rarely seen since the early 20th century). 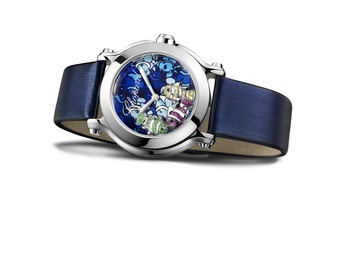 In the context of enameling, guilloche refers to the engine-work done under the surface of translucent enamel. 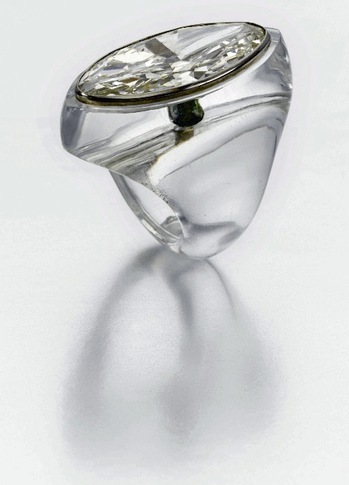 It was perfected by, and most commonly seen, Fabergé's workshops. 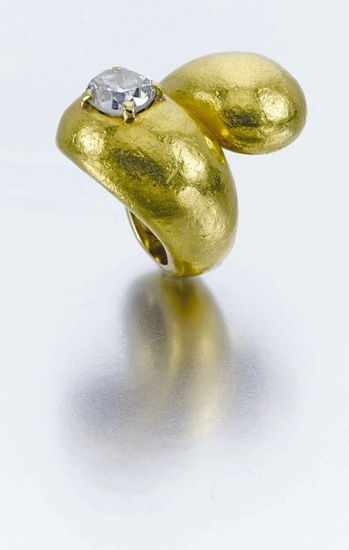 A second part of this collection has a series of "titled" rings, all in enamel, gold and diamonds. 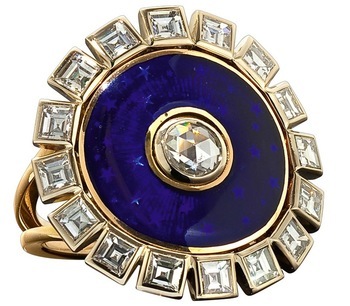 The Duchess is my favorite, with the deep purple-blue and the central rose-cut stone. 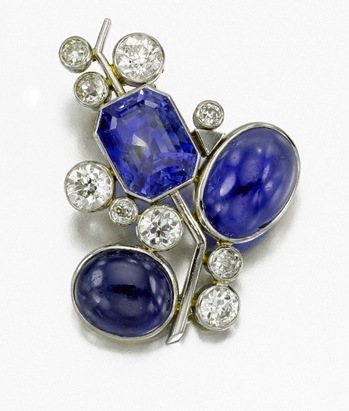 In the middle of May, Sotheby's auctioned off 60 lots, part of a collection of jewelry by Suzanne Belperron (1900-1983). 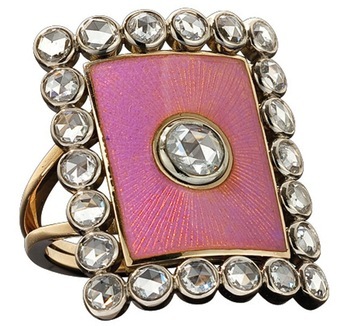 This is one of the largest collections of her designs in private hands. She worked continuously from 1930 until about 1970, a rare female designer in a predominantly male business, selling to all the usual celebrities of the day, from the Duke and Duchess of Windsor to Colette, Jean Cocteau and Gary Cooper. 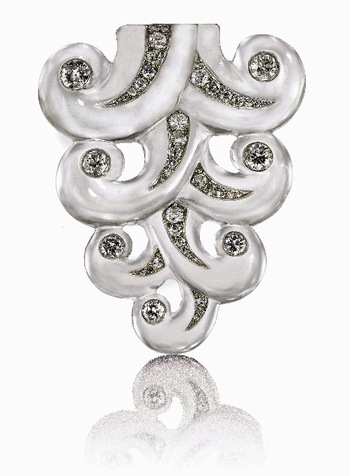 Platinum broach in the form of a branch, set with diamonds and both cut and cabuchoned sapphires. In the recent Christie's auction there were several Breguet(previously mentioned), as in made by A.L. Breguet the man not the brand, watches for sale, including 2 grand complications. 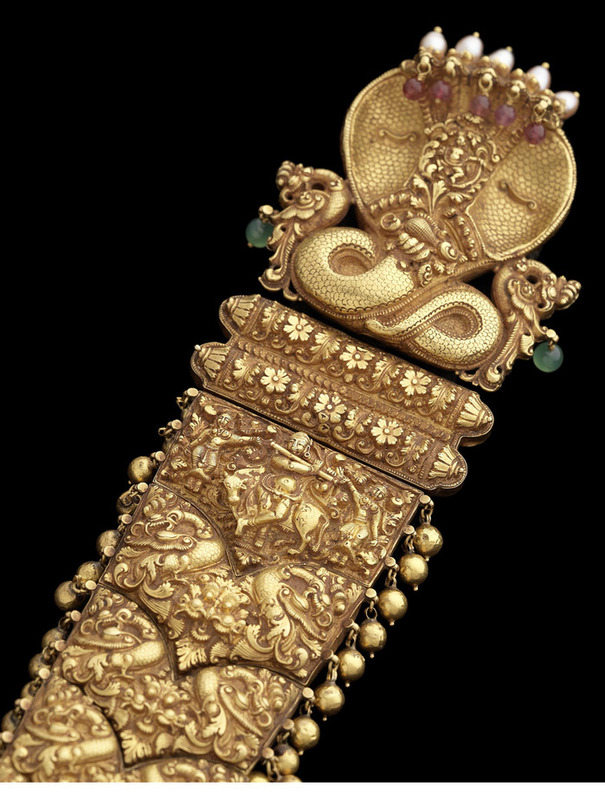 Both had been bought originally by various European nobility and passed down in private hands for more than 150 years. The first is Breguet No. 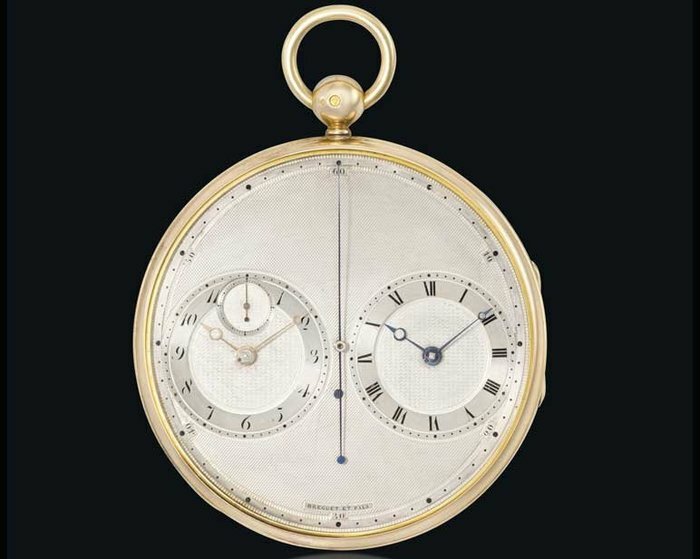 2667, originally sold in 1814, has 2 independent timekeeping movements, the one on the right driving the main sweep-second hand. In a yellow-gold case it sold for $4,680,120, the current record price for a Breguet watch at auction. 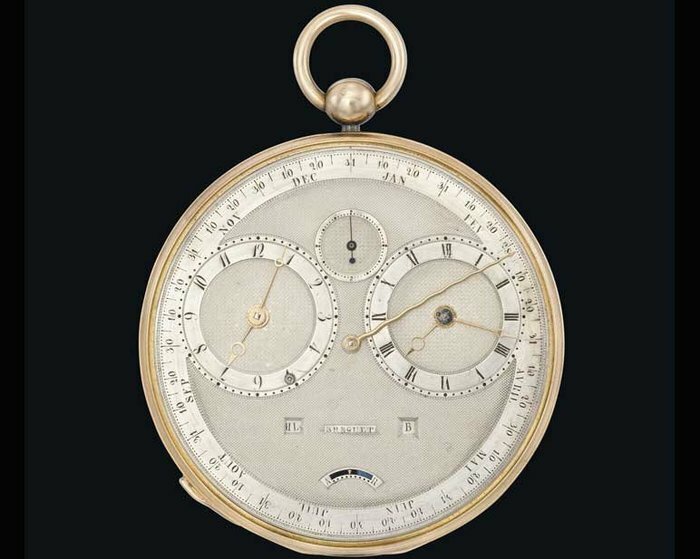 The second piece, number 4111, is a half-quarter* repeating watch with an equation of time indication, power-reserve and complete annual calendar, originally sold in 1827. It hammered at $2,750,760. Both watches were bought by Breguet, the modern brand, probably to be part of their museum collection in Paris. * Repeating watches are described by the accuracy of their chimes. An hour repeater only chimes the nearest hour, a quarter repeater chimes the hour and the number of quarter-hours past (so 11:35 would chime 11:2, 11:45 being 11:3). A half-quarter was a "cheaper than a minute repeater" design of the 19th century that chimed the number of 7.5 minute increments past the hour, so 11:35 would be 11:4 and 11:38 would 11:5.